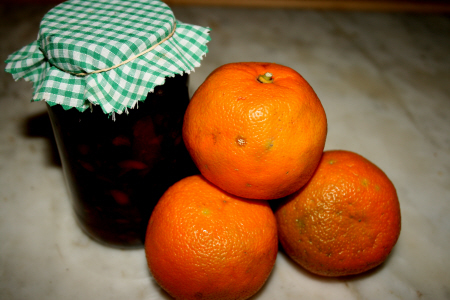 My favourite marmalade recipe, the one I use year after year comes from Jane Grigson’s beautiful “Fruit Book” first published by Michael Joseph in 1982: the simplest, easiest and best-flavoured marmalade, she says, I agree. 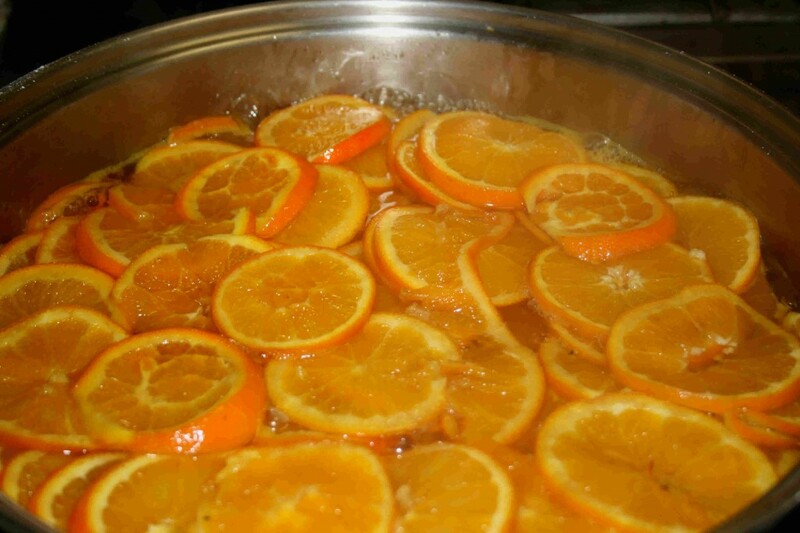 Scrub 1 ½ kilos of Seville oranges and put them in a pan with 3 ½ litres of water. Simmer until skin is tender, about 1 ½ hours. 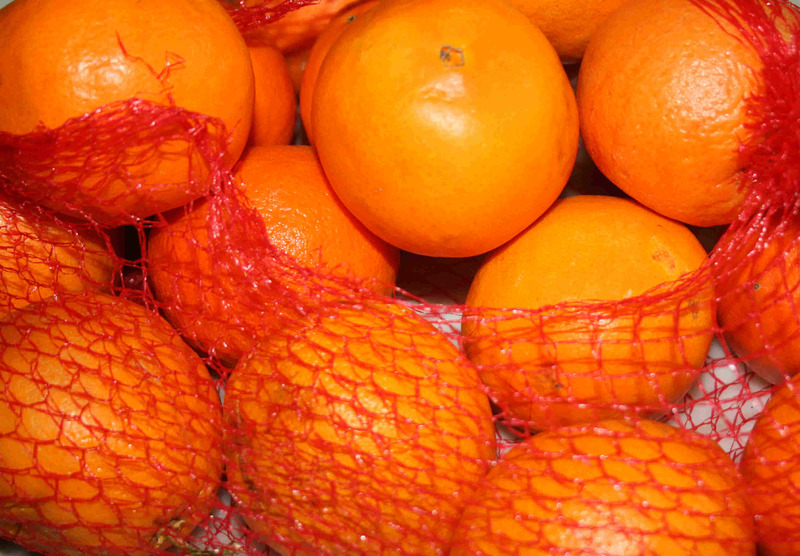 Take oranges out of the water, cool, halve and remove the pips. Put the pips in a piece of muslin. Cut up the orange flesh or pulse in a liquidiser being careful not to reduce it to a mush. Return shredded fruit to water. Add 3 kg of preserving sugar and hang the little bag of pips over the side of the pan on a piece of string so they bubble along with the fruit and release their pectin. Stir gently over heat till sugar dissolves. Bring to the boil and boil vigorously till setting point is reached. Test for setting by placing a tiny spoonful of syrup on a cold saucer and putting it in the fridge or freezer for a few minutes. If setting point is reached a wrinkled skin will form. 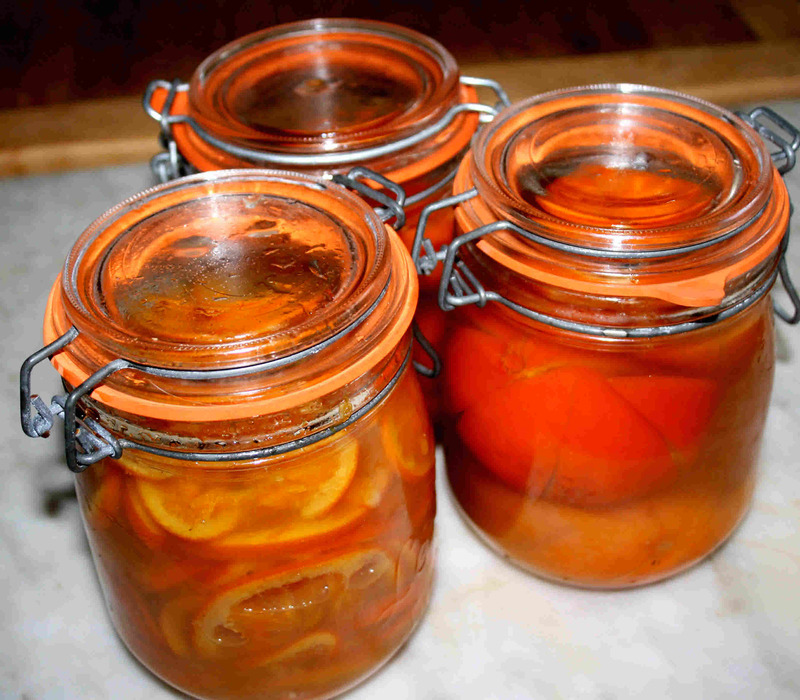 Leave the marmalade to stand for 15 minutes to allow peel to settle, remove the bag of pips and discard, then pot the warm marmalade into warm sterilised jars and cover: so nice! For 3kg of meat, I suggest belly of pork to start with, mix 500 gms of sea salt with 15 gms sugar, 1 teaspoon of crushed peppercorns, 15 gms juniper berries, 2 dry bay leaves, a sprig of thyme, 2 crushed cloves. Herbs and spices can of course be varied according to taste. Rub some of the salt mixture well into the pork skin, then, turning it over, rub more into the meat making sure no part is missed. Put a handful of salt into an earthenware or plastic bowl or bucket and place the meat on top. Pour over the remaining salt covering it completely. Cover with a piece of close fitting, boiled wood or a scrupulously clean plate and a heavy weight. Leave in a cool, dark place for four days and up to several weeks if you have used saltpetre. Do check in regularly in these modern days of central heating and double glazing. The longer you leave it the more moisture will be drawn from the meat gradually turning the salt to brine. At first the salt draws the liquid from the meat then the procedure reverses and the salt solution begins to penetrate the meat. Rinse the meat well before cooking, soaking for a couple of hours. Bring it up to the boil, drain and then simmer gently with herbs etc for about forty minutes for a piece of pork belly, longer for a larger cut. Serve hot with traditional choucroute or crisp savoy cabbage or press it under a heavy weight, slice finely and eat cold with all those pickles, chutneys and preserves.